The study will follow part of the MEErP task 1, 0 and 7. 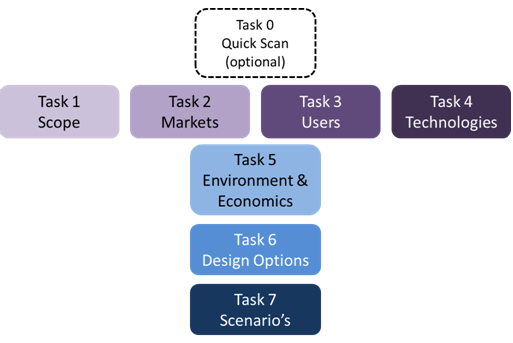 The Methodology for Ecodesign of Energy-related products (MEErP), as established in 2011, was developed to allow evaluating whether and to which extent various energy-related products fulfil certain criteria according to Article 15 and Annex I and/or II of the Ecodesign Directive that make them eligible for implementing measures. This methodology requires the contractor to carry out 7 tasks, ranging from product definition to policy scenario analysis.